Are you charging enough for your services? Chances are you’re not. The goal in pricing is not to get as much money as you can get but to get paid for the value you provide. If you have ever struggled to come up with the most accurate pricing quotes for your work, this session is for you. Understanding price anchoring is the key to getting paid what you’re worth every time. Each of us are all consumers, customers, and clients for somebody. How does price affect our buying decisions? As a freelance professional, how do you decide what your prices should be? 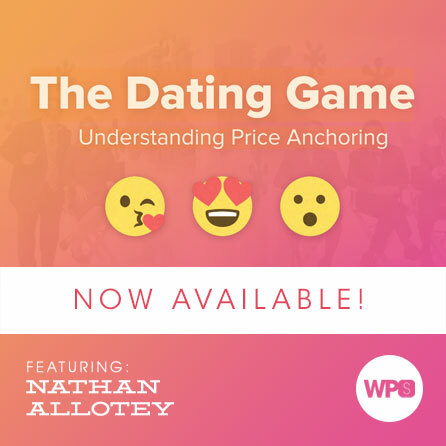 There is a particular psychology that is applied when we make decisions and pricing is no different from dating. The results are different, but the process is the same. You’re not planning on dating your potential clients but learning the factors that are a part of the purchasing decision can help you win more projects and raise your prices. If you have ever purchased any product then I can almost guarantee price anchoring was used to make you to take action. So why aren’t you using it in your proposals and with your clients? The best part of this method is you can leverage skills you already have to help you earn twice as much than you would normally charge. To this day there is one question clients ask that always makes me anxious, how much will this project cost? I would get anxious for two reasons: (1) I didn’t want to undercharge and not get rewarded for my efforts (2) I didn’t want to overcharge and scare the client away. After I started anchoring my clients I was able to secure more work and solve the dilemma of getting paid the right amount. A framework to help you charge what you’re worth. How to increase your chances of winning more projects. How to earn more income per client. A proven method to eliminate scope creep. An essential element all proposals need to have. Practical strategies to increase your pricing rate you can implement today. Strategies to help the client understand the value you bring.